“To travel is to live,” Hans Christian Andersen once wrote. Luckily, people do travel a lot today. Some people book ordinary travel tours via agencies. But more and more travelers are searching for flights, hotels, and apartment reservations and renting cars themselves. Do travelers want to waste their precious time visiting travel agencies when they can create travel packages themselves? No, they don’t. Self-planned trips are the trend now instead of ready-to-buy tours. The global online travel market is expected to grow at 12 percent from 2017 through 2023. The online travel market already has lots of solutions that aim to improve the travel experience for tourists and travelers, including different travel fare aggregators such as Expedia and Booking.com, marketplaces like Airbnb, and review portals like TripAdvisor and Yelp. But what about travel activities? Some travelers and tourists prefer group excursions to local landmarks while others are up for more authentic experiences. And who can share local experiences better than locals? That’s why local marketplaces for travel experiences have started to emerge. Let’s take a closer look at these growing travel platforms to find out what they consist of and why they’re gaining popularity so quickly. Let’s say a traveler visits Paris. What’s the best way for them to discover this new city? They could join group excursions in the Louvre or the Pompidou Centre. But that may not satisfy their appetite for cultural exchange. To discover the culture of modern cities, people have started creating Facebook groups to find locals who are willing to spend their time introducing their hometowns and sharing their knowledge of hidden gems. It isn’t quick or convenient to find locals by browsing social media platforms and specifically travel posts on Facebook, though. That’s why over the past few years, local travel experience platforms have appeared. How exactly do these platforms work? 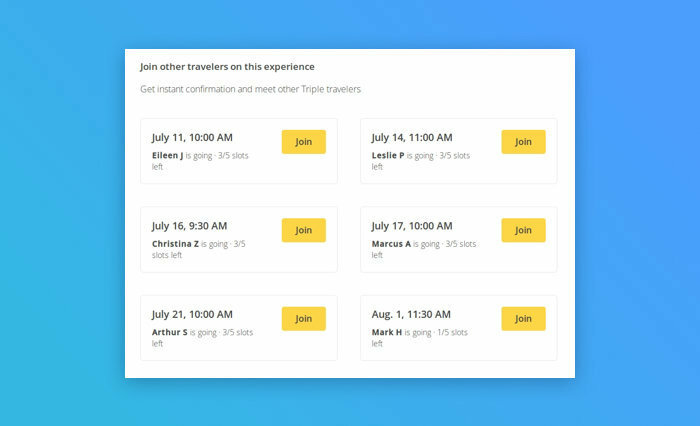 Let’s take Triple, Vayable, and Withlocals as examples. These are three fast-growing travel experience platforms. Their main function is to connect travelers with locals who earn money by hosting activities in their home cities. Based on this information, travelers can book activities that interest them. Travelers who have already tried an activity can describe their experience by rating it and providing feedback, helping other travelers to find the perfect activity for them. 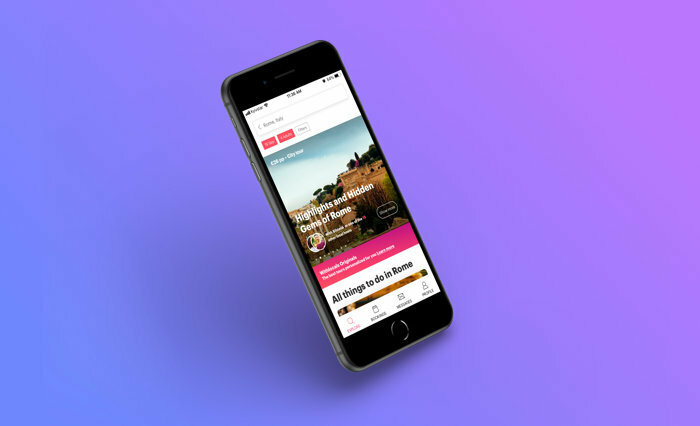 A travel experience platform has to have a mobile application. Why? Because people mostly use smartphones and tablets on trips. Many travelers just don’t take laptops with them. Lots of people need fast access to travel apps to find or check something on the go. According to Opera Mediaworks, 85 percent of activity bookings by travelers while on vacation are made via mobile apps, meaning that your travel experience platform should be mobile-first to cater to the needs of your audience. We’ve analyzed three travel experience platforms — Triple, Vayable, and Withlocals — to find out their core features. These features are crucial for your own travel platform development. A local experience platform should satisfy the needs of both travelers and local hosts to attract users. While travelers seek out interesting activities in the places they’re visiting, hosts will use your platform to make money. Let’s see how to develop a successful travel app and which features you have to implement. The first thing a user should do when they start using your travel software is to register with the platform and create a personal user account. Usually, travel platforms offer registration via email and via social log-in (Facebook or Google+). We advise offering both registration options and letting users choose. It works best if registered users are able to switch roles on your platform. For example, a user may be a host in their home city and a traveler who browses activities in other countries or cities. You should also let users change their personal data in their accounts, including their date of birth, gender, country, phone number, and preferred language. As we’re talking about a platform that connects strangers, it’s also important to confirm user identities by verifying emails and phone numbers as well as by linking social network accounts to travel platform profiles. A nice approach is to also suggest that users assign the digital copies of their IDs to confirm users’ identity. These measures can help you fill the trust gap between travelers and hosts on the platform. We’ll talk about other trust building mechanisms a bit later. Once travelers have their personal accounts set up, they can get more travel recommendations based on their preferences and booking history. Acting as hosts, users should be able to create experiences via their personal accounts. To offer an experience, a host has to provide a description so that travelers can discover what the activity or tour is about.But to describe activities, words may be not enough. That’s why you should give your hosts the opportunity to spice up activity listings with photos. The Vayable platform takes this a step further and allows hosts to share videos. Videos can introduce hosts and be used as teasers for tours and activities. Hosts should also tell the dates when activities are available and the duration of activities. So consider implementing a calendar that would be useful for both travelers and local hosts. Providing a location where an activity will take place is equally important. Each activity description should include a map showing the meeting point and, probably, the whole trip itinerary. A common solution is to implement the Google Maps API into travel platforms, as most travelers are quite used to Google Maps. Hosts can offer experiences for individuals or groups and should add information about how many people can take part in an activity. But what should a traveler who goes on a journey alone do if there are no activities for individuals? To solve this dilemma, provide an option to join group tours. This feature may also allow travelers to split the bill for activities. For example, let’s say that a local hosts a boat trip. This activity is created for six people. And one traveler wants to join other travelers on this experience. Triple, for instance, lets users join activities already booked by others. Travelers should be able to quickly find a perfect activity and a guide who offers it. To quickly connect travelers with guides, equip your in-app search engine with powerful filters. 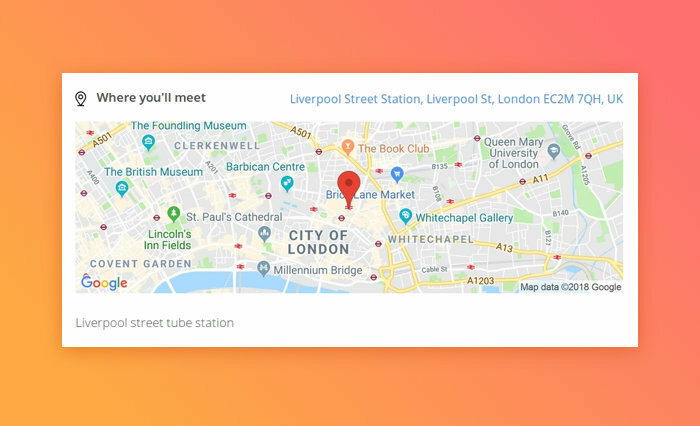 We’ve looked at Triple, Vayable, and Withlocals to define the core filters that enable quick and precise search on a travel platform. Location. This filter is the most important since travelers first of all choose the city they’re visiting. Keywords. Travelers should be able to find activities by keywords so they don’t see tons of listings for food and wine degustations if they’re looking for a photo tour, for example. Dates. Dates are crucial for travelers and hosts. Filtering by date, travelers can see only available activities. Categories. You can’t predict all the activities that hosts are going to offer, so you can just divide them into tours and activities. Or you can provide general categories for easy navigation, such as history and architecture, food experiences, shopping, sports activities, art, walking tours, boat tours, and extreme. Number of guests. Some tours and activities may be created for groups while others may be available only for one or two travelers. Price. Travelers should be able to filter activities by price. Rating. There may be many similar activities. To choose among them, travelers may want to compare activities by ratings provided by other users. Languages spoken by hosts. When discovering new countries, travelers should be able to choose tours and activities with hosts that speak languages they understand. The bookings feature shows travelers and hosts all the activities and tours they have scheduled. Bookings can include upcoming, previous, and favorite activities and tours. Travelers also can save their favorite experiences to share with friends or to repeat them. Communication between users is hard to overrate. Once a traveler chooses an activity, they should be able to contact the host on your platform. It’s important to integrate a messenger so that users continue using your travel platform instead of third-party messengers to communicate. There are quite a lot of ready real-time messaging solutions, so there’s no need to spend time and money developing this feature from scratch. As your travel app will be equipped with a built-in messenger, it’s also important to integrate push notifications to inform users about new messages. You can also send notifications to remind both travelers and hosts about upcoming activities and to offer travelers activities they may like based on activities they’ve previously participated in or based on their location. Push notifications also can inform travelers of discounts and remind both travelers and hosts to rate and review other users. An integrated payment system is also a key feature of a travel experience platform. Consider integrating PayPal, Braintree, or Stripe. There’s a wide variety of APIs and methods to choose from. Choose payment gateways depending on the area your platform focuses on. Don’t forget that integrating a gateway’s API will place the responsibility for credit card data security on your platform. Travelers and hosts should be able to provide feedback. That’s why your travel platform has to let them rate and review each other. Travelers can then check the ratings of hosts and see what other travelers have said about activities they offer. Later, we’ll discuss why this feature is important for the well-being of your users and your platform. Trust is a crucial factor in enabling interactions on platforms. Especially on platforms that presume users will meet in real life. You should try your best to build a platform where all users feel safe. Your travel platform could follow the example of Airbnb and provide onboarding both for travelers and hosts so all users get familiar with the rules of the platform. 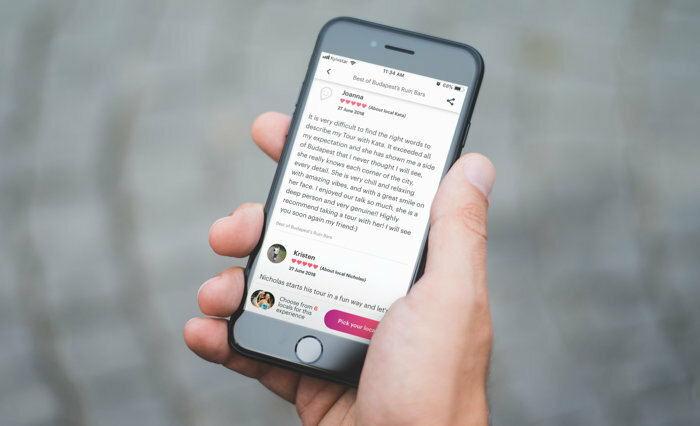 Airbnb also offers users to pass a test to ensure that they know the rules. Now let’s focus on the main mechanisms that you can implement to build trust and encourage interactions on your travel platform. You should verify each user’s identity to build trust on your platform. Users can link their Facebook profiles to their accounts to avoid being anonymous. But that’s just the first step. Your platform can verify users — especially hosts — to ensure safety. To confirm a user’s identity, your platform can require a copy of a government-issued ID, for example. If a host declines to provide a document that confirms their identity, their account can be marked as unconfirmed host. Identity verification works great on Airbnb. On your travel platform, you can ask both travelers and local hosts to provide scans of their documents and to link their Facebook profiles to their accounts on the platform. This way hosts also will feel safer. It’s important that users give feedback to each other. That’s another way to build a safe platform where users aren’t scared to meet strangers. Community feedback may take several forms such as reviews, ratings, votes, and comments. Let hosts and travelers rate each other. User feedback is also crucial for a travel platform because it allows the community to regulate itself. From the very start, you should lay down the rules of your travel platform. These rules will nudge travelers and hosts toward desirable actions. You can create a simple list of actions that are forbidden on the platform and ban users who break those rules. That's one way to increase trust on your platform as both hosts and travelers could be sure they’re connecting only with users who follow the rules. A platform’s culture also plays an important role in building a safe environment. To create a friendly community, your platform should foster interpersonal connections. The travel experience depends on emotions that travelers live through. So your platform should be a place where travelers can find great friends who share their passions. As of May 2017, Triple had already managed to generate revenue of over $15,000 per month. Withlocals is expected to generate $6.8 billion in 2020, according to analysis of a July 2017 study from Eye for Travel. And both platforms are spending money on launching in new areas to attract more users. But how do these platforms make money? Triple charges hosts a service fee of 20 percent. Withlocals also charges hosts 20 percent of their revenue. But Withlocals also offers hosts an extra service — Withlocals Originals. These are ready-made tours or activities that hosts can learn and offer to travelers. These experiences are optimized through market research, so Withlocals guarantees a competitive and unique offer. 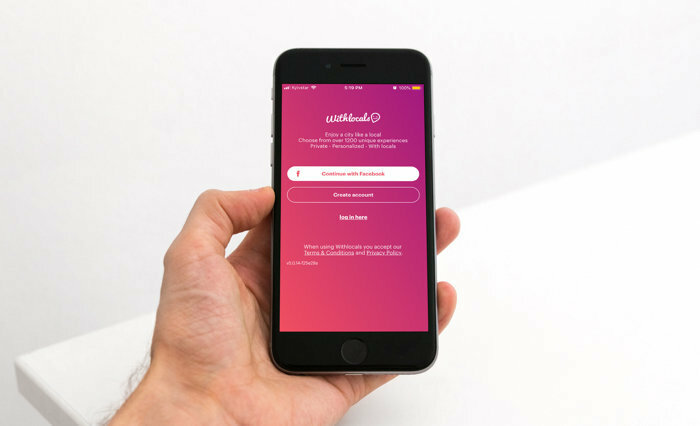 Hosts who use the Withlocals Original service are charged a 30 percent fee. In general, local travel experience services charge hosts for promoting their tours and activities via a platform. But you can also use a bit of a different business model and charge both user roles like Airbnb does, for example. To create an online travel platform for local experiences you should first implement core features to provide a great user experience. But you should also focus on implementing mechanisms that help make your platform safe. As a travel experience platform is developed to connect people around the world and let them meet in real life, you need to ensure that they can trust your platform. Make sure your platform also provides great iOS and Android apps so that travelers can use it on the go. Time to develop a travel app? There’s no better place to start your journey than Yalantis.